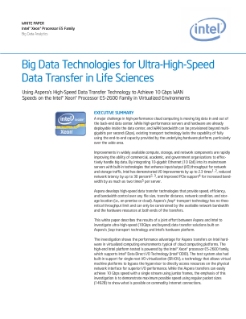 The white paper describes the results of a joint effort between Aspera and Intel to research ultra-high-speed (10 Gb per second and faster) data transfer solutions built on Aspera fasp* transport technology and an Intel® hardware platform. While the Aspera transfers can achieve 10 Gb per second with a single ...stream using jumbo frames, the emphasis of the investigation is to demonstrate maximum possible speed using regular packet sizes (1492B) to show what is possible on commodity Internet connections. The test system has built-in support for single-root I/O virtualization, a technology that allows virtual machine platforms to bypass the hypervisor to directly access resources on the physical network interface for superior I/O performance. Read the full Big Data Technology Enhances Ultra-High-Speed Data Transfer White Paper.